Institution of Automobile Engineers President 1921-22. 1876 June 25th. Born at York the son of William Watson (c1837- ), Engineer / Whitesmith, and his wife Eliza. 1901 Drawing office of the British Power, Traction and Lighting Co of York, where he worked on Gardner-Serpollet motor vehicles. Became head draughtsman in 1902. 1903 Joined Herbert Morris and Bastert of Loughborough as designer. 1903 Entered the office of Thornycroft Steam Wagon Co in Chiswick as a designer. 1904 September 6th. Married at South Wimbledon to Rose Ellen Susannah Turner. 1911 Living at Sundridge, Glebe Avenue, Woodford Green: George William Watson (age 34 born York), Mechanical Engineer and Draughtsman - Motorcar Engineering. With his wife Rose Ellen Susanah Watson (age 33 born Manchester) and their children Lily Watson (age 5 born Basingstoke) and William Edward Watson (age 2 born East Sheen). 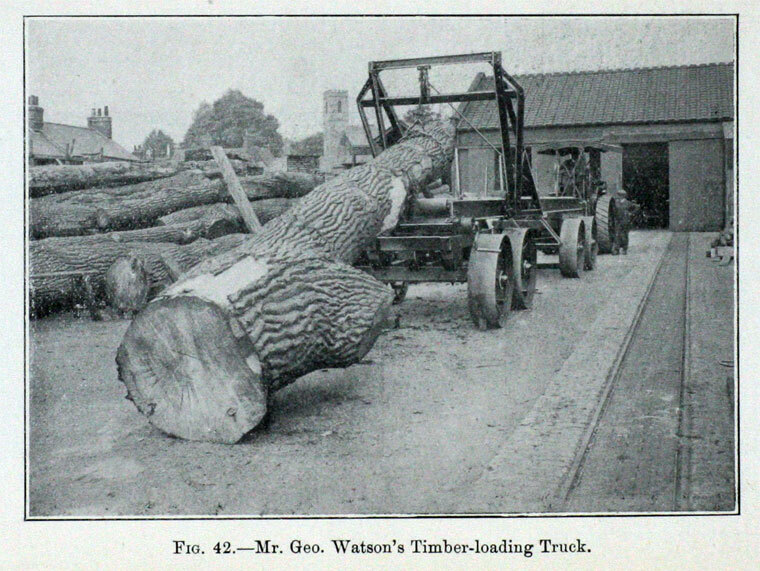 GEORGE WILLIAM WATSON was the designer of the Watson drawbar dynamometer, which was first demonstrated at the Shrewsbury tractor trials in 1921 and has since been supplied to agricultural and technical institutions throughout the world. He was born in 1876, and after studying at the Yorkshire College, Leeds, joined the staff of Messrs. Serpollet in 1897. Subsequently he became engaged on design work for Messrs. Thornycroft of Basingstoke, and he was also for some years on the staff of the Commercial Motor. In 1912 he commenced practice as a consulting engineer. 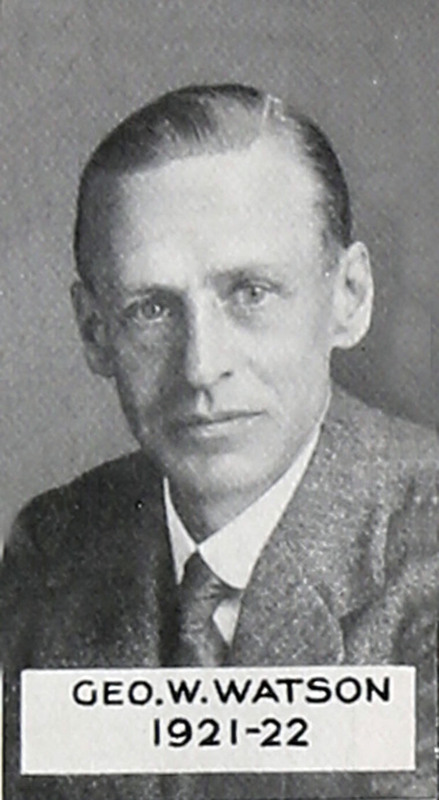 During the War, Mr. Watson held the post of consulting engineer to the Ministry of Munitions and chief of design (engines and transmission gear) to the Mechanical Warfare Department. His work in the latter capacity was chiefly concerned with the design of tanks. He went to France with each new design and studied the performance of the machines under working conditions. In 1918 Mr. Watson was sent to the United States as the representative of the Carter Deputation of the British War Mission. Latterly he was one of the two civilian associate members of the sub-committee of the interdepartmental committee to co-ordinate the supply of mechanical transport to the three fighting services. He was elected an Associate Member of the Institution in 1903 and was transferred to Membership in 1912. He was a Past-President of the Institution of Automobile Engineers. His death occurred on 21st January 1932. George William Watson was born in 1876, and was educated at Yorkshire College, Leeds. After serving his apprenticeship with Sir James Kitson, he joined the Serpollet Company, and was later appointed Designer at John I. Thornycroft and Co., Ltd. He left the Company in 1907 to join the staff of Temple Press, Ltd., as Assistant Editor of "The Commercial Motor," and on relinquishing this position in 1912, commenced in business as a Consulting Engineer, subsequently rising to considerable eminence in his profession. He was elected a Member of the Institution in 1907, and joined the Council in 1912, serving continuously thereon up to the time of his death, which occurred on 21st January, 2932, at the age of 56. He was Vice- President from 1918 to 1921, and President during the Session 1921-22. He was a member of practically all the Sub-Committees of the Council for many years, and did an enormous amount of most valuable work on behalf of the Institution. "THE LATE MR. G. W. WATSON. It is with great regret that we record the death of Mr. George William Watson, which occurred on January 21 last, at the comparatively early age of 56. Mr. Watson was widely known as a consulting automobile engineer, and took a particularly active part in the affairs of the Institution of Automobile Engineers, from whose Council he will be greatly missed. Born in York in 1876, he received his technical education at Yorkshire College, Leeds, and his practical training with Sir James Kitson, of the same city. His association with the automobile industry, which was destined to continue throughout his life, commenced in 1897, when he joined the Serpollet Company. It is of interest to recall that this was only two years after the first petrol car was introduced into England from France, although ten years after M. Serpollet had constructed his first steam tricycle. Later, Mr. Watson joined the staff of Messrs. John I. Thomycroft and Company, Limited, first as a designer in the internal-combustion engine department of the Chiswick works, and later, as chief draughtsman at the Basingstoke works. He left Messrs. Thomycroft in 1907 to take up an appointment on the technical staff of The Commercial Motor. At this time, he was also engaged upon advisory work, and was consulted by the Natal Government in connection with the importation of agricultural machinery and motor vehicles. He also acted for the town councils of Worthing and Newport (Mon.) as consultant in connection with the purchase of motor fire engines and other equipment. He resigned his position on The Commercial Motor in 1912, and has since been in private practice as a consultant. He acted as consulting engineer to several of the more important British commercial vehicle manufacturers, to the Commercial Motor Users’ Association, and was technical adviser to the Agricultural Committee of the Society of Motor Manufacturers and Traders. He was also chairman of the technical committee of the Royal Automobile Club, and of the Automobile Industry Committee of thé British Engineering Standards Association, now the British Standards Institution. During the war, Mr. Watson was consulting engineer to the Mechanical Transport Department of the Ministry of Munitions, and was later transferred to the Mechanical Warfare Department as chief of design for the engines and transmissions of tanks. At the time of the Armistice, he was in the United States as a technical member of the British War Mission. He took a keen interest in the application of tractors and other power-operated implements to farming in this country, and was responsible for the design of the dynamometer used in the tractor trials held at Shraw-ardine in 1921. This instrument was described in Engineering, vol. cxiii, page 814 (1922). He was a member of the Institution of Mechanical Engineers, and was elected president of the Institution of Automobile Engineers in 1921. He had been a member of the Council of the latter body since 1912." This page was last edited on 22 February 2018, at 08:21.